Mash the sardines in their liquid in a medium bowl. Add egg, oil, cheese and bread crumbs. Mix well. Mixture will be crumbly. Shape into 24 small balls. 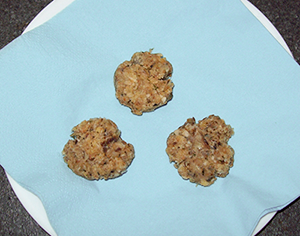 If the mixture will not hold together add water, 1 tablespoon at a time until it will. *Many cats are lactose-intolerant. The cheese may be eliminated or replaced with lactose-free cheese. Check with your vet. These crackers should only be an occasional treat for your cat. (No real cat should eat the way Owen and Hercules do.) And be warned: these smell very fishy while they're cooking. According to the ASPCA, "a cat born and raised in the wild, or who has been abandoned or lost and reverted to wild ways in order to survive, is considered a free roaming or feral cat. While some feral cats tolerate a bit of human contact, most are too fearful and wild to be handled. Ferals often live in groups, called colonies, and take refuge wherever they can find food—rodents and other small animals and garbage. They will also try to seek out abandoned buildings, deserted cars, even dig holes in the ground to keep warm in winter months and cool during the summer heat." 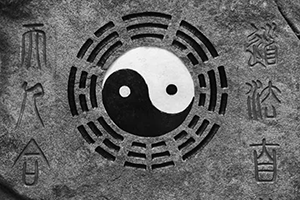 Tai Chi Chuan is an exercise form that has been practiced for centuries. It's suitable for people of all ages and helps improve concentration, discipline and balance. Wu style Tai Chi Chuan has 108 movements which make up the form. To see the form, click here. 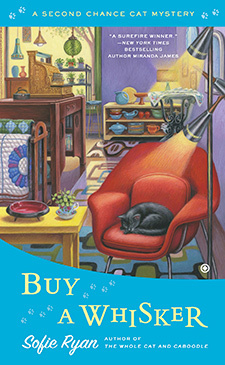 Second Chance is Sarah Grayson's store in the Second Chance Cat mysteries, a repurpose shop where Sarah and her friends give new life to old items. It's her second chance at a career and the second—at least—of his nine lives for Elvis the cat. I admit I love prowling through re-purpose shops and thrift stores, but some people find them a bit intimidating. 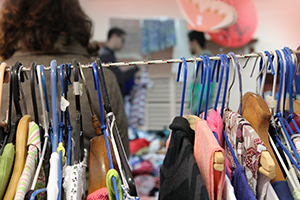 If you're new to thrifting, keep these guidelines in mind. Try not to judge a thrift store by the way it's organized or the fact that most of the items are in bins instead of on hangers and shelves. Give a store at least one chance before you decide it's not for you. You may be surprised by what treasures you unearth. Part of the fun of thrift shopping is finding the diamond among all the lumps of coal. I like to think of it as treasure hunting. Coming home with a bargain takes patience and a keen eye. Read the labels. Feel the fabric. I tend to stick with items that can be washed rather than dry cleaned. What would that table look like with a new coat of paint? Would that skirt be better if you shortened the hem? If I'm shopping at a thrift store I'm generally not looking to bring home a sweater from a discount retailer. I'm looking for higher end clothes. Pay attention to which thrift stores tend to sell which brands. Those are the real deals. Check for missing buttons, zippers that slide smoothly, ripped seams and stains. A sweater with a few pills can be revived. A white shirt with a coffee stain can't. I have bought items missing buttons before, but only because I have a large box of buttons with my art supplies. (Okay, two boxes, but who's counting?) I've also bought shirts I wasn't crazy about simply to get the buttons to put on something else. Not all thrift stores offer exchanges. Make sure what you're buying fits. If there's always a line up for the changing rooms or they're non-existent, carry the measurements of the clothes that fit you well. I laid my favorite jeans on the floor and measured the inseam, the length of the rise in the front and the back, as well as side to side at the waist and at the hips. I also know the length of the arms on my favorite sweater. Remember to drop off the things you're not using or wearing anymore. Make sure the clothes are clean and still have some wear in them. That stretched out tee shirt you used to sleep in is not donation material. That blue shirt that's a bit too tight is. Walking into a thrift shop for the first time can be a little intimidating but it can ultimately be good for your wallet and the planet. And if you always wanted to hunt for treasure when you were a kid—I can't be the only one—now you can! Owen and Hercules from the Magical Cats mysteries are not exactly ordinary house cats. How many ordinary cats can walk through walls and disappear at will? They don't exactly have ordinary digestive systems either, and they eat way more people food than a real cat should. Real adult cats need high-quality, nutritious food to stay healthy. They shouldn't be eating peanut butter and banana toast or tomato and mozzarella sandwiches. The best source of information about feeding your cat is a veterinarian. How much your cat should be fed, depends on its size, age and how active it is. Treats should be a very small part of a cat's diet. All cats need free access to clean, fresh water. In their guidelines for feeding your cat, the ASPCA says, "Milk should not be fed to cats as a treat or as a substitute for water. Cats do not possess significant amounts of lactase, the enzyme that breaks down lactose in milk." In other words like a lot of us, they're lactose intolerant. Cats like meat for a reason. They require a meat-based diet to get all the amino acids their bodies need to meet their nutritional requirements. Tuna is not a substitute for a nutritionally balanced, quality cat food. Eating it all the time could result in a Vitamin E deficiency, which could cause some serious health problems for your cat including steatitis. As always, the best source of information about caring for your cat is your vet. Have you ever been inside a Carnegie library? It's possible that you have. A Carnegie library is one that was built with money donated by Scottish-American industrialist Andrew Carnegie. My childhood library was a Carnegie building. So is the Mayville Heights Free Public Library in the Magical Cats mysteries. Andrew Carnegie attributed his success in life to the fact that he had access to lots of books when he was a child. However, in the late 19th century, most library use was by subscription, which meant books were only available to people who had the money to pay. Carnegie believed that libraries should be available to everyone. He used part of his fortune to build more than 2500 of them around the world, the earliest ones in places where he had a personal connection, including the very first one in Dunfermline, Scotland where he was born. The first American Carnegie library opened in Braddock, Pennsylvania in 1889. It was designated a National Historic Landmark in 2012. Most of the Carnegie libraries have a similar design. They were built from stone or brick with more than one set of stairs at the entrance, very much in the style of the times. The steps up to the entry way represented Carnegie's belief that a person can be raised up by learning. 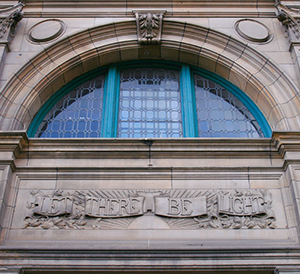 The building in Dunfermline features a stylized sun at the entrance with the motto, "Let there be light," a detail I gave to the library in Mayville Heights as well. A community had to meet a number of requirements to receive a Carnegie library grant. Not only did it have to show a need for a library and agree to use the building only for that purpose, it also had to provide the land and pay for the annual operating costs. Carnegie and his assistant, James Bertram, fielded thousands of requests for grants. Some were turned down because they felt the town or city already had an adequate facility or because the community wasn't willing to commit the funding for running the library. However sometimes a community turned down a grant. Saskatoon, Saskatchewan refused a grant because they were looking for more than twice the amount Carnegie had offered. Several places said no because they had problems with his business practices and his role in the Homestead Steel Strike of 1892. According to some estimates, by the time all the library grants had been given out, Andrew Carnegie had spent close to 60 million dollars. More than half of the buildings in the US, built more than a century ago, still serve their communities. Today Carnegie libraries continue to follow Andrew Carnegie's mission for them, acting as sources of information and education, connecting the community with materials, technology and services for the 21st century. No word on whether any of them have a couple of Magical Cats dropping by! In the Second Chance Cat mysteries Alfred Peterson, aka Mr. P, is a licensed private investigator. Could he meet the requirement to be a real investigator? Yes, he could, as Mr. P. himself explained in A Whisker of Trouble. "I'm sorry,"[Nick] repeated, "but you're not a licensed private investigator. The state has rules." For a moment I didn't know what to do with my hands because I was pretty sure I couldn't follow my first impulse for what to do with them, which was to slug him in the arm. Rose moved closer to Nick and I took a step closer to both of them in case she decided to slug him, but all she did was pat his arm and give him a smile of pure condescension. "I know that, dear," she said. "But I don't own the agency. Neither does your mother. Alfred does. And he is a licensed private investigator." Rose turned to Mr. P. and beamed and he beamed right back at her. Nick's mouth gaped like a goldfish that had jumped too high and had suddenly found itself outside the fishbowl. Liz caught my eye over the top of Rose's head and winked at me. "I'm over 21 and I'm an American citizen," Mr. P. said, squaring his shoulders with just a bit of pride. "I have no criminal record and I passed the exam with flying colors." "Alfred has an excellent memory," Rose added. Nick pulled a hand across his mouth. "It's not possible," he said. "You don't have any experience in law enforcement." "Chapter 89 of the Maine Revised Statutes, section 8105, 7-A, experience, paragraph D," Mr. P. recited. "A person is qualified to be a licensed private investigator who possesses a minimum of 6 years of preparation consisting of a combination of: work experience, including at least 2 years in a non-clerical occupation related to law or the criminal justice system; and educational experience, including at least: an associate degree acquired at an accredited junior college, college, university or technical college in police administration, security management, investigation, law, criminal justice or computer forensics or other similar course of study." "I told you he has an excellent memory," Rose said. I wondered how long it had taken Mr. P. to commit that legalese to memory. A flush was creeping up Nick's face from his neck. "I have a four year Bachelor's degree in computer science with a specialty in computer forensics," Mr. P. continued. He gave a sly smile. "I'm not just a pretty face." I could see Liz smirking at me out of the corner of my eye but I refused to look in her direction because I knew if I did I was toast. "And I've been working with the Legal Aid free clinic for the last three years, doing research and computer work," he finished. Nick's mouth worked, but no sound came out. For more information on private investigators in Maine, check out the full list of requirements here.